Happy holidays everyone! Now that the holiday season is winding down I wanted to discuss a topic that always provokes a lot of questions. Many parents have questions about the differences between the pharmacological (medicine/drug) behavior management techniques offered for children for dental treatment. These techniques include nitrous oxide, oral sedation and general anesthesia. 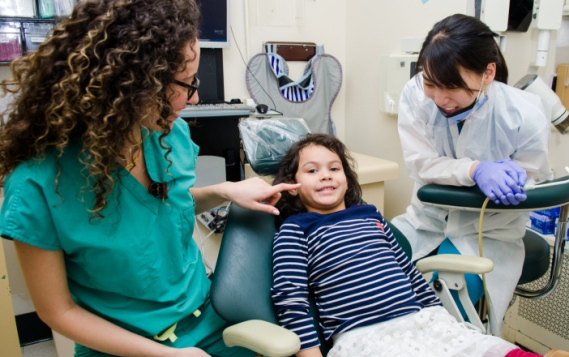 Every child has different dental needs and different comfort levels. Some require more attention, sedation, etc when it comes to making their dental treatment easy and successful. In our office we offer all three forms of pharmacological behavior management to aid in providing proper dental treatment to our little patients. Below is a brief explanation of the different pharmacological techniques to help answer some of the most common questions. Nitrous oxide is a colorless and odorless gas that is mixed with oxygen to help reduce anxiety and pain. It is administered through a small nasal hood that fits over an individual’s nose. It is not intended to, nor is it able to induce sleep or loss of consciousness when used as a single agent. Nitrous oxide causes minimal impairment to the protective reflexes, such as breathing, swallowing, and coughing and vitals signs are typically unchanged. Nitrous oxide is more commonly known as laughing gas or happy air because it can cause one to feel slightly euphoric, tingly, and warm. Nitrous oxide has a rapid onset, is easily titratable (effects are easily adjustable), and its effects are quickly reversible. Nitrous oxide has an excellent safety profile with no recorded fatalities or significant cases of morbidity when used appropriately. Nitrous oxide is often used for pediatric dental patients who are generally cooperative, but have mild to moderate anxiety or to help relax patients that require extensive or lengthy dental procedures. There a very few contraindications for the use of nitrous oxide such as pregnancy, chronic obstructive pulmonary disease, and severe emotional disturbances and drug related dependencies. Oral conscious sedation is an advanced pharmacological behavior management technique in which a combination of one or more oral medicines are administered to a patient to help reduce pain and anxiety for a procedure. Commonly used medicines for oral sedation are midazolam (Versed), diazepam (Valium), meperidine (Demerol), and hydroxyzine (Vistaril). The depth of sedation with oral conscious sedation should range from mild to moderate, and if done appropriately should not result in the loss of consciousness (resulting in sleep in which one can not be easily aroused). Under moderate sedation a patient should have a depressed level of consciousness, but still have the ability to respond purposefully to verbal commands or after light tactile stimulation. Furthermore, cognitive function and coordination can be altered, but protective reflexes should remain intact. Under moderate sedation a patient should not require any medical intervention to maintain an open airway, adequate ventilation, and proper cardiovascular function. Oral sedation is frequently used in conjunction with nitrous oxide. Oral sedation is often used for patients that are moderately fearful or anxious, that can not cooperate due to the lack of psychological or emotionally maturity or that have mental, physical or medical disabilities. Oral sedation is contraindicated in patients that have medical or physical conditions that could interfere with the effects of the sedation or increase the risks. Some examples include obstructed airways due to large tonsils, uncontrolled asthma, allergies to the sedative agents, obesity, and cardiovascular defects. Oral sedation can be used safely and effectively for many patients, but may not be adequate for some patients that are very young (usually under the age of 3 years) or that are extremely fearful or uncooperative. Oral sedation must be administered by an appropriately trained and certified pediatric dentist. General anesthesia is drug controlled state of unconsciousness with the loss of protective reflexes in which the medicines are administered via inhalation and/or intravenously (IV). Patients can not be aroused verbally or with tactile stimulation. The patient’s airway and cardiovascular system are maintained with help from the anesthesia provider. The layman’s terminology for general anesthesia is “put to sleep” or “put under”. General anesthesia is frequently used for very young dental patients that are unable to cooperate due to the lack of psychological or emotional maturity (usually under the age of 3 years), patients that have mental, physical or medical disabilities, patients that require extensive dental treatment, patients that are extremely fearful or anxious, and patients that are inappropriate candidates for oral sedation. General anesthesia is only administered by an anesthesiologist in either a hospital based setting or in an outpatient setting such as a private office or surgical facility. I hope these brief descriptions help explain the different pharmacological behavior management modalities that we offer in our pediatric dental offices. These descriptions are not meant to be inclusive and do not discuss risks associated with the procedures. If you have additional questions, please contact our offices.